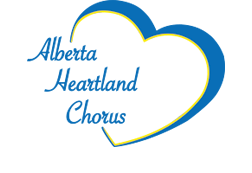 Alberta Heartland Chorus held an Open House for those interested in learning about a cappella harmony. Our guests were enthusiastic and eager to share. By the end of each evening they had learned two pages of a new song, in thier designated part. The chorus welcomed them on the risers and a wonderful time was had by all. We are always happy to see guests at our rehearsals, so if you are interested in hearing some harmony and learning more about this wonderful organization, please feel free to drop in any Tuesday night at 6:30 p.m.
6:30 P.M TO 9:30 P.M.